If you’re in the market for a very easy-to-setup integrated development environment for R, wander over to RStudio.org. They’ve just released a beta version of their freely-available front end for R that runs under Windows, Linux and Mac OS X (for R versions 2.11 and later). If you’re not familiar with the idea of an integrated development environment, it’s simply an attempt to bring all of the tools needed for working with R into one uniform interface. Much like the basic Rgui, you’ll get an R console window, windows for writing scripts (or Sweave documents), plus you’ll get dedicated areas to display the objects you have in memory, help pages, available packages and plots. 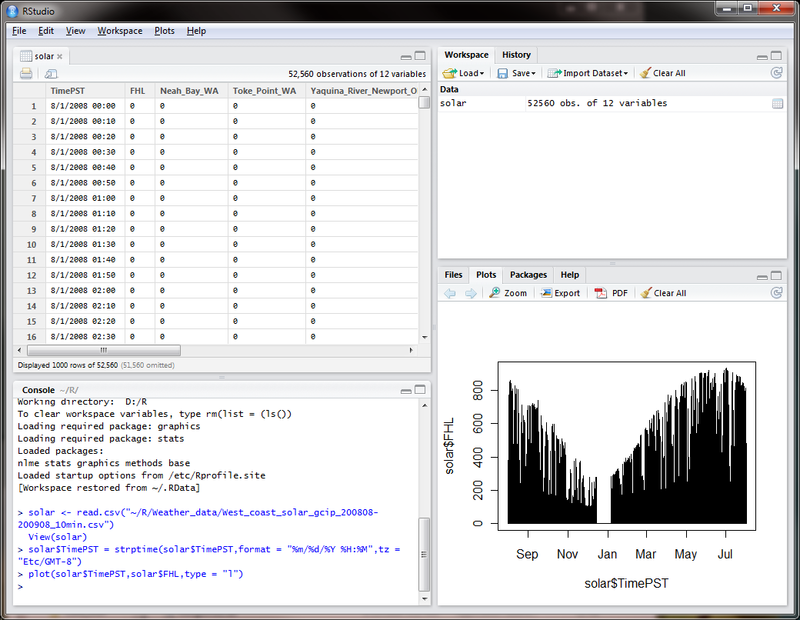 An example of the RStudio workspace. The contents of a data frame are shown in the upper left, the R console in the lower left, a plot in the lower right, and a list of the objects in memory (only 1 currently) in the upper right. RStudio is easy to install. Assuming you already have R installed on your computer, simply download the (free and open-source) RStudio software and install. From that point on, when you want to work with R, just open the RStudio program, and it will spawn a new R session inside the RStudio workspace for you to use. There are plenty of built-in keyboard shortcuts for switching between tabs, submitting lines of code and other common operations. You might also find the Import dataset button helpful for previewing data files and converting them into data frames. The plot window includes options for saving and exporting your graphics. The Packages tab includes a button shortcut to install new packages from the CRAN repositories. Keep in mind that RStudio doesn’t turn R into a menu-driven gui like Rcmdr or Deducer, so you’ll still need to learn all of the exciting and esoteric R commands to do your analyses, but you really should be learning them anyways, shouldn’t you? I think the one detail I’d like to see added is a way to expand the descriptions of the objects available in the workspace object browser. In the Eclipse/StatET object browser, you can expand the contents of a data frame and view the mode, class, and the first few values of each column in the data frame without opening the data frame in a separate viewing tab. I find this supremely handy for quickly reminding myself what’s in each data frame. To do the same in RStudio, you need to open the data frame in a View tab just to see the names of the columns and the values, and you can’t immediately ascertain the mode and class of each column (i.e. is it a factor, a character vector, a POSIXt vector or list, etc.?). RStudio.org also offers a version of their interface for server installations of R, which I haven’t played with.